A friend from my hometown in Oregon asked if I’d make an urn to honor the memory of his son who passed away recently. Among many other accomplishments, his son was an avid hunter. 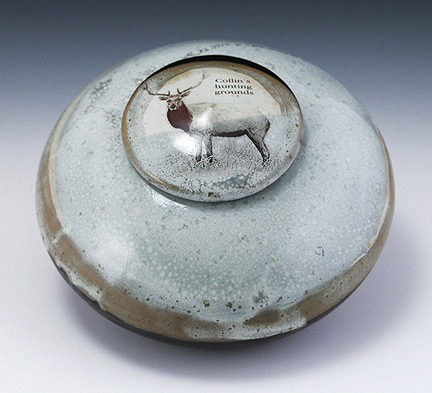 And so, my friend asked if I could incorporate an image of an elk on the urn with a few chosen words. The laser decal process worked well for this request and I think the result was better than I could have imagined. I hope this urn can somehow bring some peace for this special family. Wow Melynn, you created something so beautiful for your friend to remember her son. Hi Michelle, thanks for leaving a comment. Yeah, the decals take a bit to figure out, but it’s worth the effort when everything goes according to plan. I’ve never tried lusters – gotta put that on my list!